Hopscotch is getting ever so close and today they revealed the schedule for the coveted day parties. Stroll around to all of the best local music spots on any given Hopscotch day and you're guaranteed to find either a familiar hometown artist or discover new budding talent. 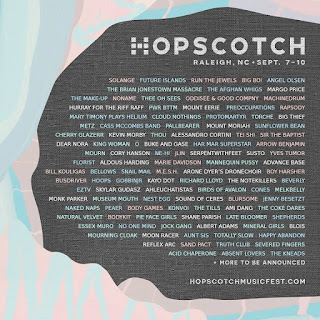 Either way, a true lover of music can't go wrong with the variety provided by Hopscotch, especially with the day parties. Check out the full schedule here. Also don't forget that main stage tickets to see Future Islands, Run the Jewels, Solange and Big Boi go on sale this Thursday, August 24th. Don't miss the full event happening throughout downtown Raleigh from September 7-10.